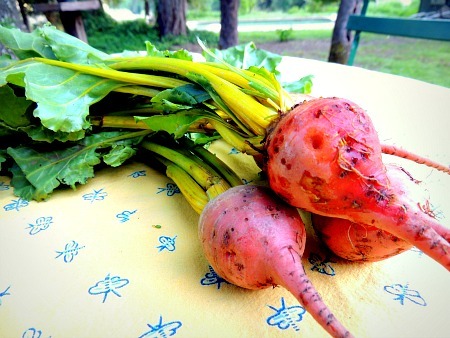 How To Cook Beets - How simple can it get? If you want to know how to cook beets look no further. This could not get much more simple. You can probably look in any cookbook for beet recipes and see them steamed, boiled or even roasted with water in the pan. Actually the latter is really steaming them more than roasting them. That’s not how I cook them. The best way I believe that will give you the most intense flavor and will retain the most nutrients is to roast them just with olive oil as you do potatoes and winter squashes. This is the simplest and the most flavorful way to cook beets as far as I’m concerned. For a roasted beets recipe click here. There are other interesting ways to prepare beets. Since beets are so nutrient dense it makes sense to eat them even if they are high glycemic root vegetables. They are NOT carbohydrate dense like breads, crackers and other starchy foods and nobody ever got fat eating too many fruits and vegetables! This is why the glycemic load is a more precise way of evaluating your carbohydrate choices. There are ways to eat beets cold that are especially appealing in the summer. You can make them into a cold soup, called borscht. They still require cooking. But you don't have to cook beets at all! Just peel them and grate them raw into salads. The easiest method when you are looking for how to cook beets is to roast them in a hot oven (400 degrees) as above only wrapped in aluminum foil. They take about an hour to cook. Let them cool and it's easy to remove the skins. Now they are ready to quarter and put into salads. They are great with greens, goat cheese and chopped walnuts. Or you can just grate them already cooked and toss them with a vinaigrette. A wonderful combination for juicing beets is with carrots, another vegetable in the moderate range. Yes they are moderately high on the glycemic index. Carrots have a glycemic index of 47 and like beets (69) they are nutrient rich and of course they are not a bit starchy. You can and should eat both of these vegetables (and drink in juices) even if you are eating a low glycemic plan. Do not let the glycemic index confuse you on this one. The glycemic load is more important when it comes to losing weight. Beets are NOT starchy vegetables. Vegetables are especially important to drink as juices to get enough of all the valuable nutrients they contain! The beauty of cooking for yourself is you can eat so healthy on a budget. Maybe the art of cooking is coming back. I hope so. If we're going to be thin for life we need to know how to cook, period! Beets do NOT have to be complicated to prepare and they are cheap. Roasting them either tossed with olive oil or wrapped in aluminum foil make them fast and easy. Then you can enjoy them with seasonings or in a salad. Return from How To Cook Beets to Eating Healthy on a Budget. Return from How to Cook Beets to Lifetime Fat Loss home page.